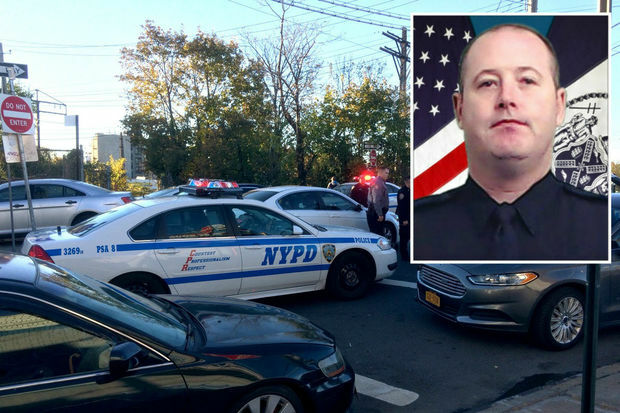 A veteran NYPD sergeant, Paul Tuozzolo, was fatally shot in the head and his partner wounded during a gun battle with a heavily armed man in the Van Nest section Friday afternoon, officials said. 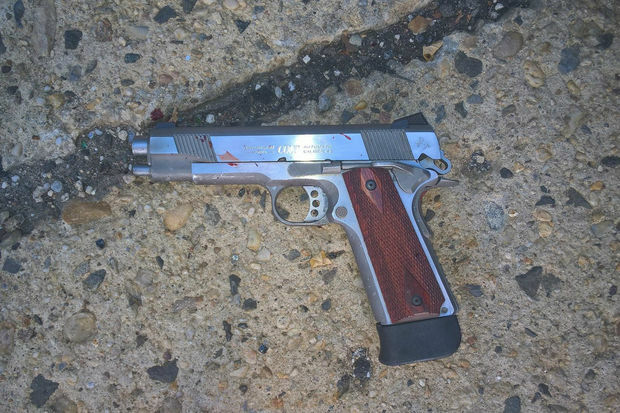 THE BRONX — A veteran NYPD sergeant was fatally shot in the head and his partner wounded during a gun battle with a heavily armed man in Van Nest Friday afternoon, officials said. Sgts. Paul Tuozzolo and Emmanuel Kwo confronted Manuel Rosales, 35, who had broken into his estranged wife's home on Beach Avenue near Merrill Street just before 3 p.m., NYPD Commissioner James O'Neill said during a press conference at Jacobi Hospital. “I always talk about what a great job this is," said O'Neill. "But there's nothing worse than a day like today." Police were told Rosales was in a red Jeep that officers spotted four blocks away at 1575 Noble Ave. at the corner of Mansion Street, officials said. Video captured the action of the chilling confrontation, in which police pinned Rosales' Jeep against a curb and he began to try to climb out of the passenger window, sources said. Sgts. Tuozzolo and Kwo approached Rosales, but Rosales suddenly opened fire with a chrome Colt .45 caliber handgun, hitting Tuozzolo in the forehead before the sergeant could shoot, sources said. Tuozzolo's partner immediately moved around the back of the car, using it for cover, as he fired at Rosales, wounding him, sources added. Several other officers who rushed up from their cars, including a rookie cop fresh out of the academy, "took combat" stances and also fired, hitting Rosales several more times, killing him, sources said. He was carrying multiple weapons, sources said. Both wounded sergeants were taken to Jacobi Hospital, where Tuozzolo was declared dead a short time later, O'Neill said. Tuozzolo, a 19-year NYPD veteran, lived in Suffolk County with his wife and two children. 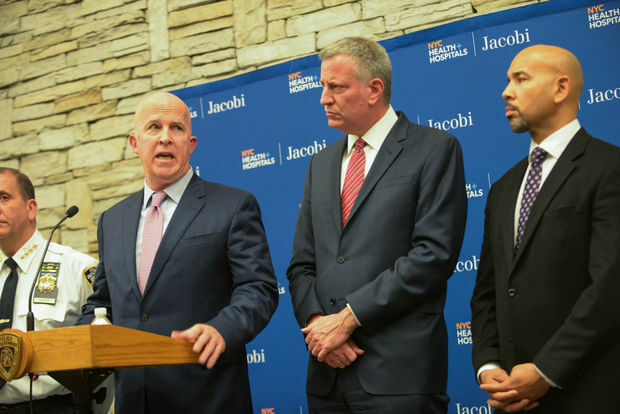 His body was driven off the Jacobi Hospital campus Friday night, flanked by police officers and escorted by a fleet of NYPD motorcycles and vehicles. Kwo, a nine-year veteran, was struck in the leg, O'Neill said. De Blasio ordered city agencies to fly all flags at half-staff starting sunrise Saturday in honor of Tuozzolo, the mayor's office said. Edward Mullins, president of the sergeants union, said Tuozzolo was a personal friend and precinct representative. 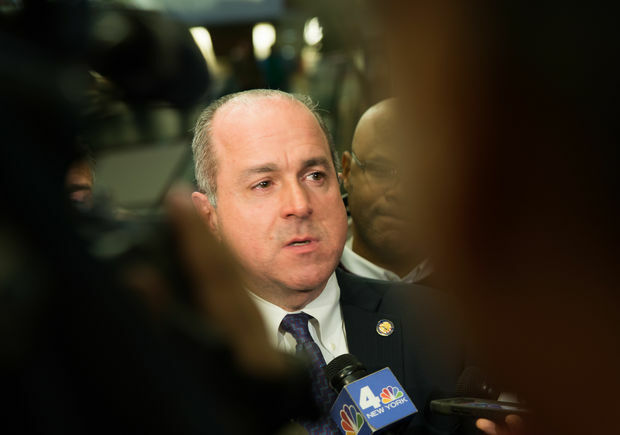 "He was a great guy, just an unbelievably nice guy," added Ed Mullins, president of Sergeants Benevolent Association. "What occurred here today was the result of police officers protecting a woman who was afraid of her own husband. "Sadly Paul was killed doing what police officers do every day of the week, doing what police officers are doing right now as we speak," he concluded. "We should be calling for all members of the public to support law enforcement, they're protecting your communities, trying to go home to our families."